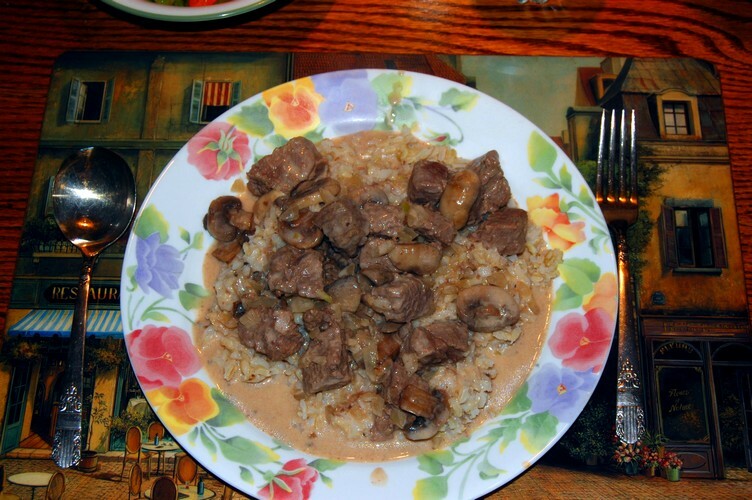 Most everyone loves the beefy creamy taste of Beef Stroganoff. A kind of one pot casserole cooked on the stove it satisfies a family and uses less electricity (or gas) to cook than a traditional casserole cooked in the oven. This recipe will be similar to many that populate the internet with the exception that it is back to basics with fresh wholesome ingredients rather than an over-reliance on canned mushroom soup like so many recipes that I see. Beef tenderloin can be found on sale sometimes but we usually buy a large pack of it from BJ's Wholesale Club. If it's too much money to be considered then you can substitute Sirloin Steak instead just increase the simmering time. Cut meat across the grain into 1/2" strips, about 1 1/2" long. Melt butter in large skillet, add mushrooms and then onion, cook until tender. Remove from skillet. Add butter if necessary and cook meat until light brown. Stir in 2/3 of the broth, ketchup, garlic, and salt. Cover and simmer 15 mins (25 for sirloin). Mix reserved broth and flour; stir into meat mixture, add mushrooms and onions. Heat until boiling, stirring constantly. Boil and stir 1 minute, reduce heat. Stir in sour cream and heat through. Serve over egg noodles, yield about 4 servings.